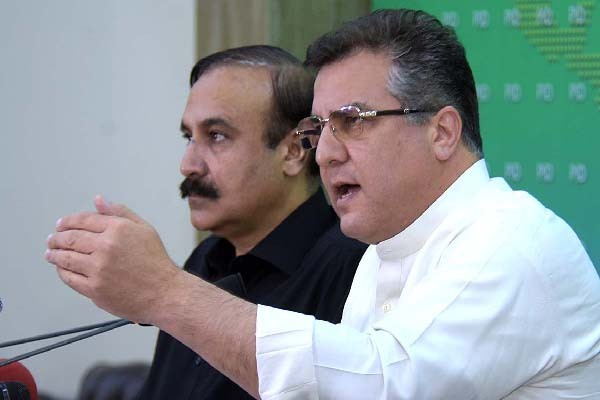 ISLAMABAD, Oct 21 (APP): Member National Assembly PMLN Daniyal Aziz Friday said Imran Khan was seeking support of Jehadi organizations for creating chaos in Islamabad. Speaking at a press conference here, he said Imran Khan was looking for weapons and was making calls to gather 500 armed persons in Islamabad. In meetings of PTI, he said Imran Khan was provoking his workers to get into fight of some kind and resort to violence. And these reports were reaching the government through credible sources, he said. During the recent meetings of Jehadi organizations, Imran Khan asked them to provide 500 of their men for creating chaos, he continued. Earlier Imran Khan had support of Tahirul Qadri but this time it was not available, he added. Daniyal said Imran Khan was called Taliban Khan and PTI blocked the roads of NATO containers and called for opening of Taliban offices in the country. He said videos were viral on the internet in which he used foul language against the security agencies. At different international forums, Imran Khan again used bad language against secuirty agencies, he added. Daniyal said Apex committees, National Action Plan and Zarb e Azb operations had improved law and order situation. There was time when Taliban were 60 kilometres from Islamabad and Imran Khan was making speeches in support of jehadi organizations, he recalled. He said Imran Khan was indulging in baseless propaganda against PMLN leadership and also took money from zionist organizations. He said Supreme Court rejected Imran’s claims of rigging in elections. Imran Khan was appearing before Supreme Court in Panama Leaks case while he and Tareen refused to appear before Election Commission to reply to applications filed against them. Imran Khan met Indian Prime Minister Narendra Modi after requesting for a five minute meeting, he told. Imran at one time wanted joint nuclear control with India, he added. He said Imran Khan invested Zakat money in British Virgin Island and hide information about his offshore company Niazi Services Limited. While other PTI leaders also had offshore companies. Imran Khan was also involved in business with Indians, he added. Imran Khan was throwing tantrums and had a lust for power, he said adding PTI was also wary of setting of local bodies government in Punjab as it thought it would further decrease its chances for a win in the next elections. Imran Khan did not believe in Parliament and other state institutions and was only misguiding people with his claims like “35 punctures”, he remarked. Daniyal said PTI sidelined Accountability Commission in Khyber Pakhtunkhwa to hide its corruption. He said Imran Khan was giving false dates for downfall of government and there was no justification for locking down Islamabad with the help of Jehadi organizations. Daniyal said Imran was not using his democratic right for protest but was trying to provoke people to violence. Daniyal said on November 2, law would take its course and the situation would be managed in Islamabad.